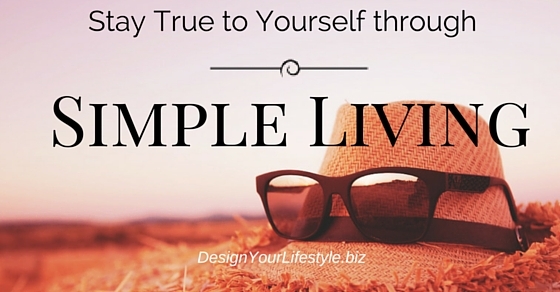 How can you stay true to yourself through simple living? My grandmother used to say, “If you don’t love what you have, you can’t love another thing.” She was sharing the concept of simple living. You embrace what you have, accumulate less, and hopefully have more time, energy, and money to spend on what’s truly important to you. However, if you don’t know what’s truly important, then simple living becomes a bit more complicated. Knowing yourself and staying true to that person will help you embrace your life fully and live well with what you have. The concept of simple living is easy enough. You embrace what you have, accumulate less, and hopefully have more time, energy, and money to spend on what’s truly important to you. However, if you don’t know what’s truly important, then simple living becomes a bit more complicated. Knowing yourself and staying true to that person will help you embrace your life fully and live well with what you have. As consumers we often accumulate goods without putting much thought into them. When you know who you are and what you want, and you stay true to yourself, you consume less. Instead of allowing impulse shopping to take over, you’re able to stop and ask yourself if the purchase supports you and your desired lifestyle. Mass consumption becomes a thing of the past and conscious consumption becomes your way of life. Living well with what you have means that you are grateful for the items and people in your life. It also means that you love yourself. And to be able to get to a point where you love yourself and can surround yourself with people and things that support you, you have to know yourself well. You have to know what your strengths and weaknesses are. Staying true to yourself begins with knowing yourself and then creating a life that suits you. Gratitude plays a significant role in living well with what you have. Instead of always wanting and needing more, you can be grateful for what you have. This mindset and level of personal awareness is essential because it is easy to slide back into old habits. Staying true to yourself also requires a great deal of awareness. You have to be able to listen to your instincts and also your thoughts. You have to be able to sort your temporary emotions (the ones that say that you absolutely must buy that new pair of shoes) with the vision that you have for yourself and your life. Living well is about finding a lifestyle that supports who you are and what you want. It’s impossible to find that lifestyle and to maintain it if you aren’t able to stay true to who you are. Every day you’ll be bombarded by distractions and messages that are contrary to your vision of your future. You’ll be told that all the cool people have the new phone or wear designer shoes or have granite countertops. It can wear you down if you don’t know who you are and what you want from this life.